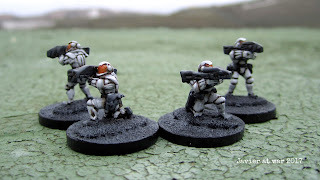 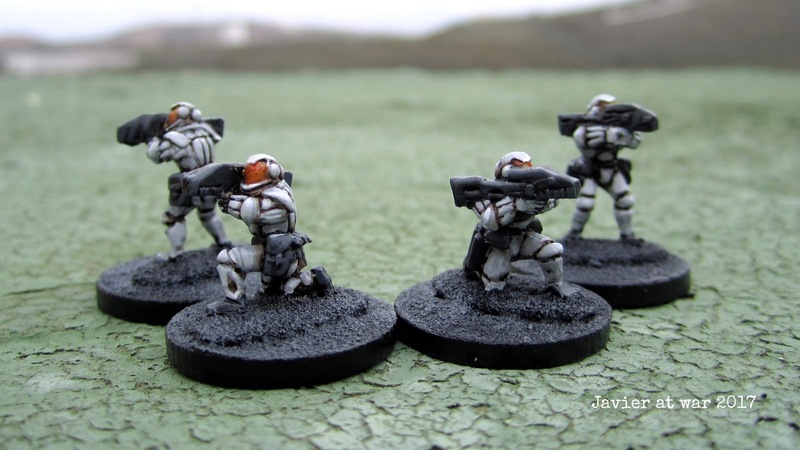 I am making the most of my free time and painted this batch of troopers for my skirmish games. 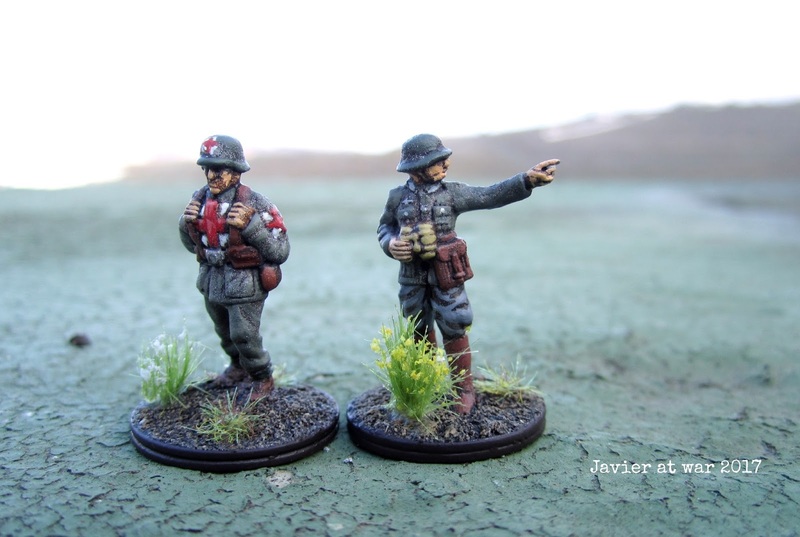 They are from the excellent Khurasan range. 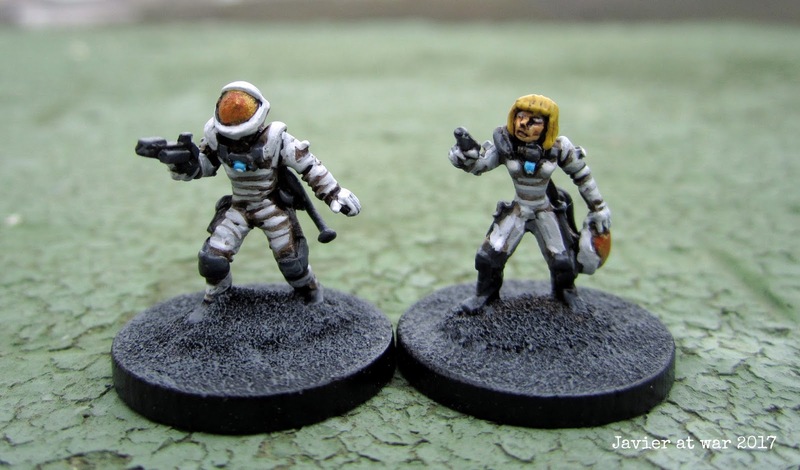 Great sculpts, crisp casting and top service, highly recommended. 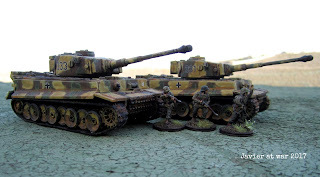 In the pictures below you can see two Tiger I tanks I ordered to China, both for 14 $ including shipping. They are not model kits but toys and the scale is not exact; they are two or three millimetres longer in hull and one or so high in turret, but I do not care much as they are Tigers and this way they look more terrifying. 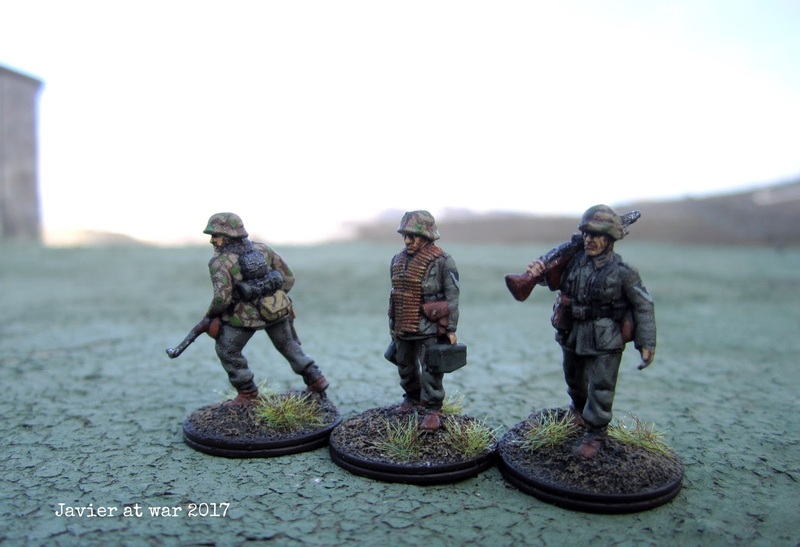 I added a few PSC soldiers for scale comparison. 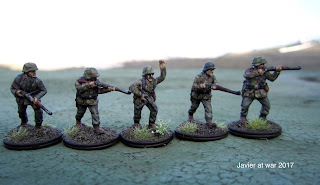 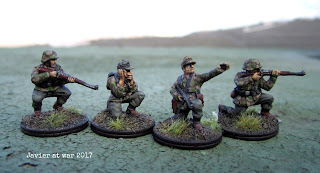 They came in green and with some patches of yellow sprayed on them and I had planned to use them as they were but then I saw it was too much green and started to add more colours and when I realised they were totally painted, but without priming them first. Anyway I think they turned out OK in the end and naturally I used them in our next game. 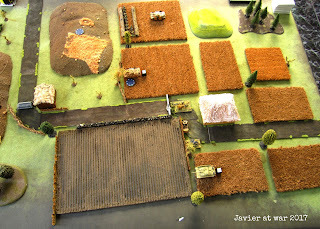 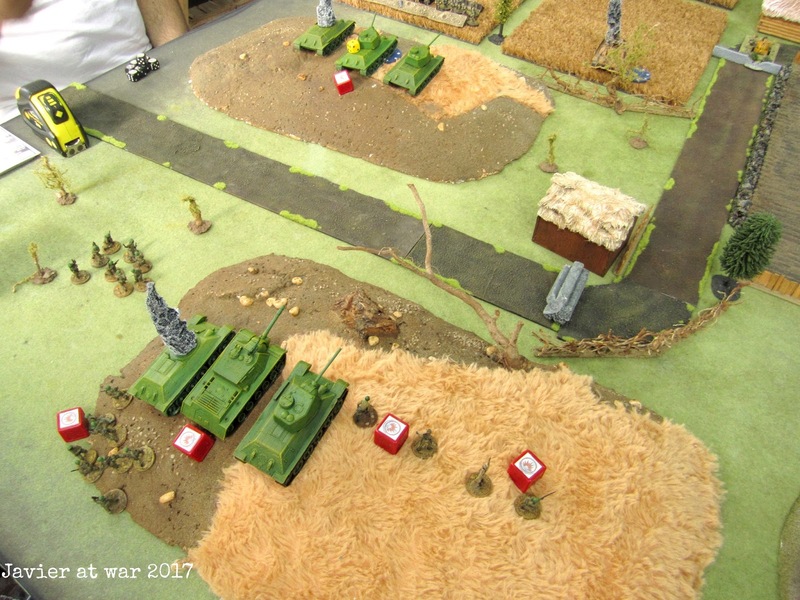 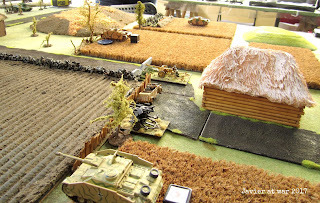 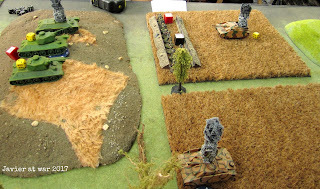 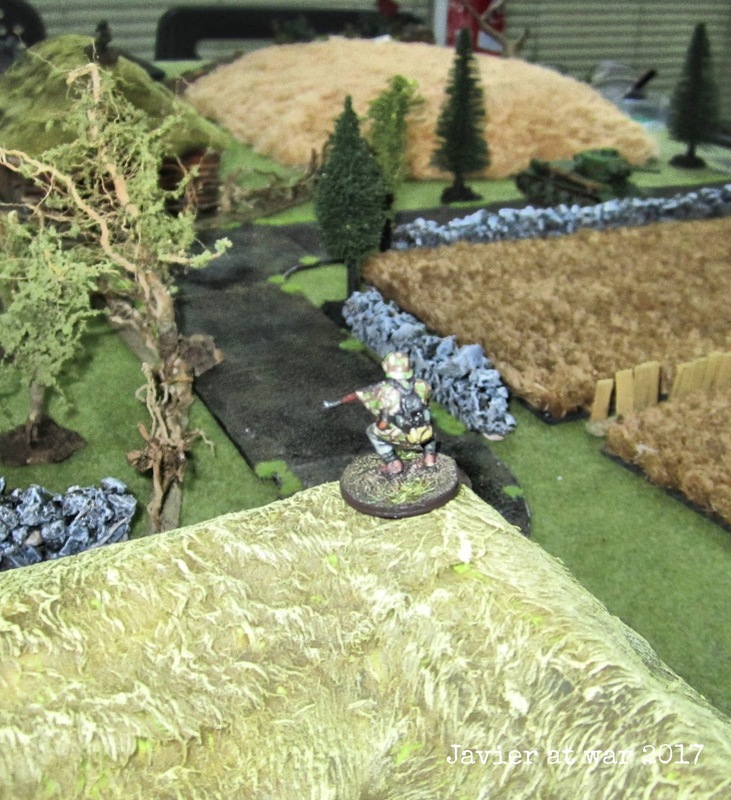 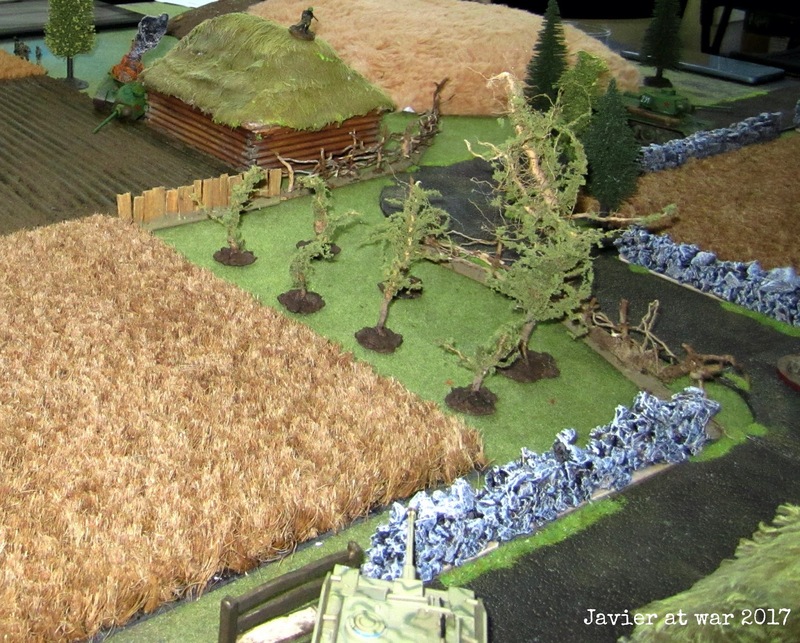 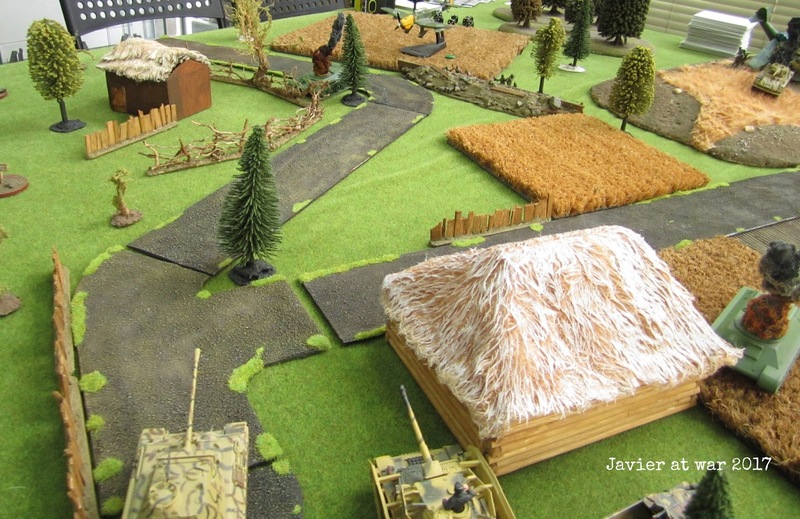 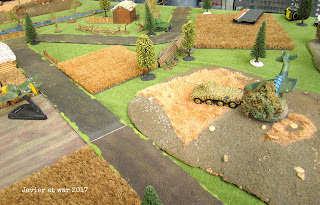 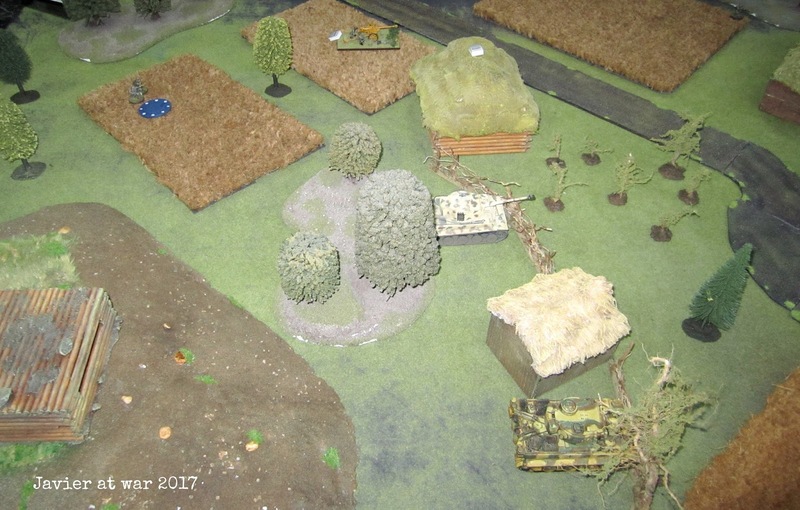 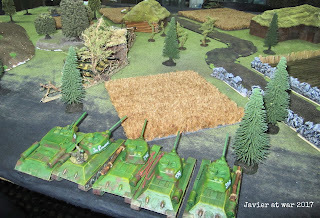 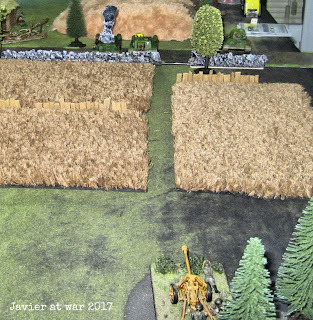 We played Strong point assault at 500 points, me defensively with Germans and my friend Alex with his Russians; all terrain handmade by him. 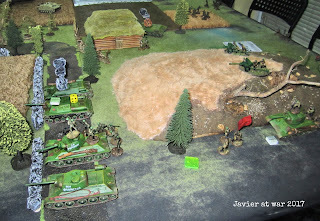 I had 29 BR points and my opponent 35 points thanks to his commissar. 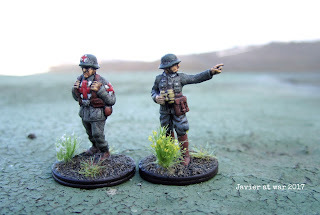 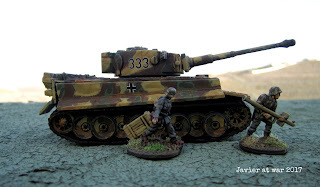 German forces deployed and waiting for the Russians. 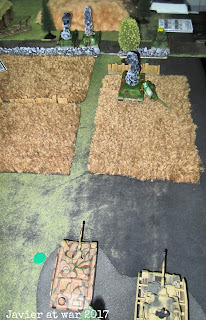 One Tiger was kept as reserve to enter on turn 4 together with most of the infantry. On turn 3 Russian reinforcements entered on their left flank and the Tiger destroyed the most dangerous of their tanks in ambush fire, a SU-152; the rest were T-34s. 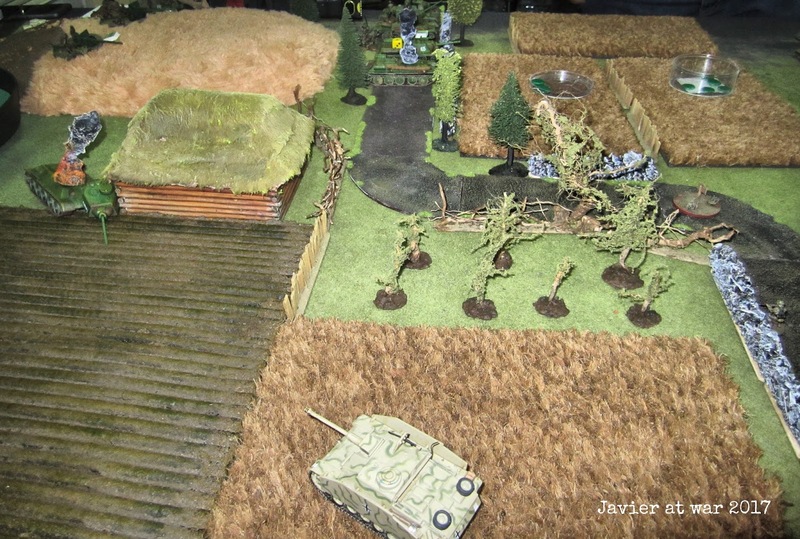 On the right flank it only entered a lonely T-34 with tank riders who after being ambush fired from the house, their remnants died trying to assault it, and then the tank destroyed by a PAK 40 at point blank. Boing, boing, boing! Russians could not pierce the Tiger's skin and he slowly started to kill them one by one. End of turn 4 and all my German infantry reinforcements were already advancing towards the only objective in Russian hands. They finally managed to destroy one Tiger but the other one out of the picture ultimately broke the Russians. 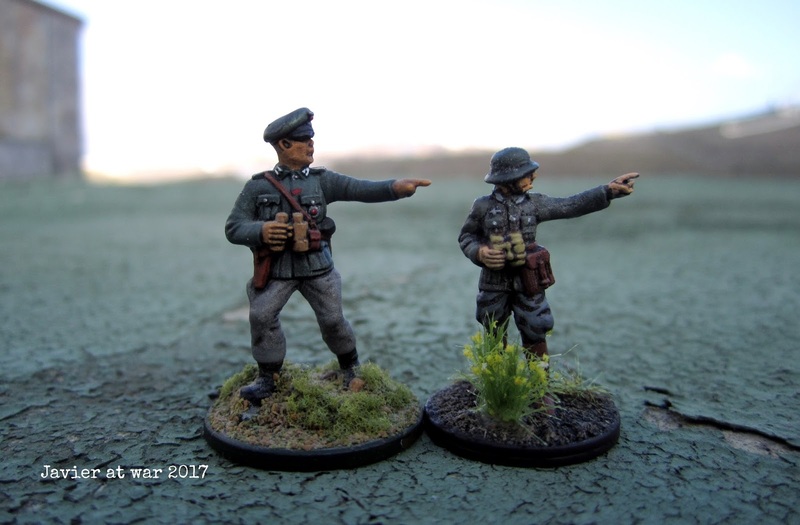 German 19 - Russians 38. 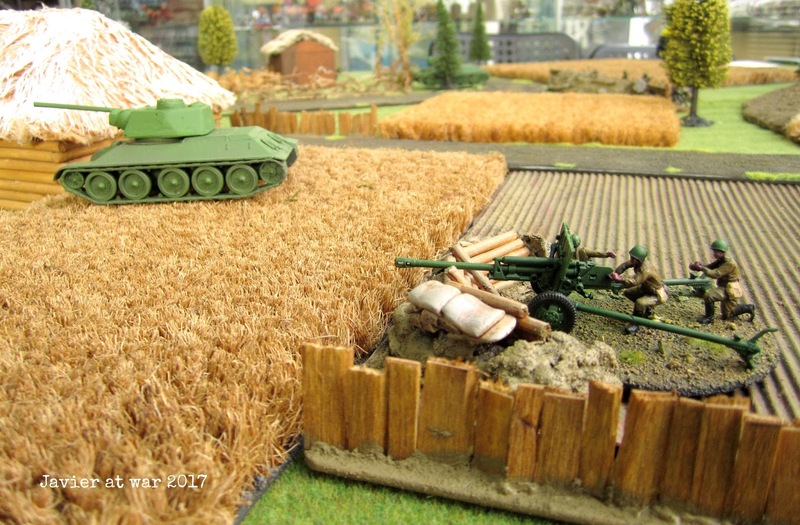 I think if all Russian tanks would have entered on the other flank where the solitaire PAK40, things had gone differently. 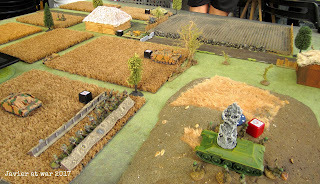 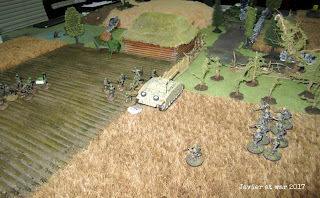 Today we played Defend High Ground from the Battlegroup Kursk at 500 points only as we do not have time to play larger games at the moment, but we are making plans to meet one Saturday to play a 1.000 points game. All terrain by Alexis (the Russian opponent). 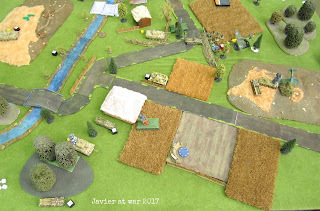 I played defensively with the Germans and picked one FHQ, one grenadier platoon with one Pak40, one flak 38 (using a proxy here), one sniper, one 120mm on board mortar, one Stug III G squadron and one panzer IV E. I also had a HMG, a bunker and a minefield for free. 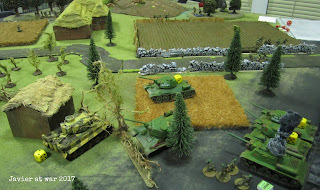 I do not remember exactly what the Russians chose but you can guess by looking at the pictures: two Zis3, five T-34, one ISU-152, FHQ, commissar, a medium mortar off-board battery, one sniper, one platoon of infantry and some tank riders. 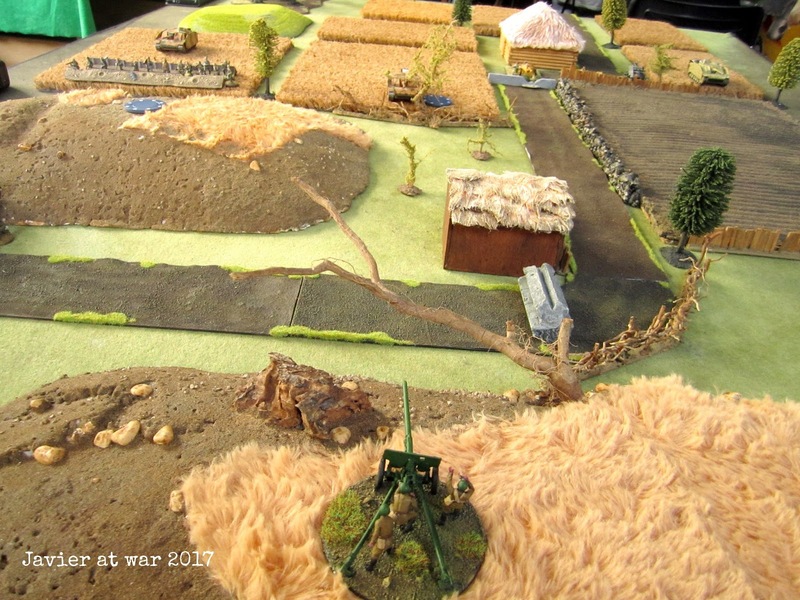 Initial deployment. 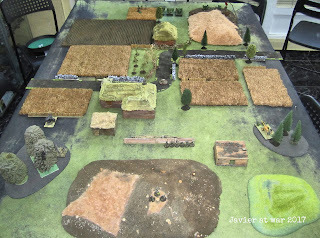 Germans at the bottom of the picture. 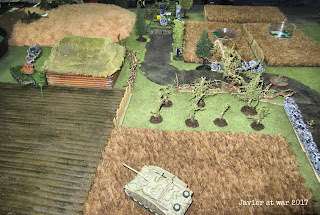 The three objectives were the big hill where I started, plus the two big houses. 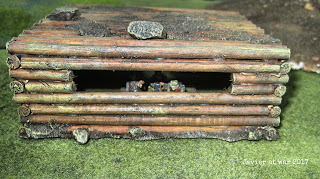 The MG42 team inside the bunker. 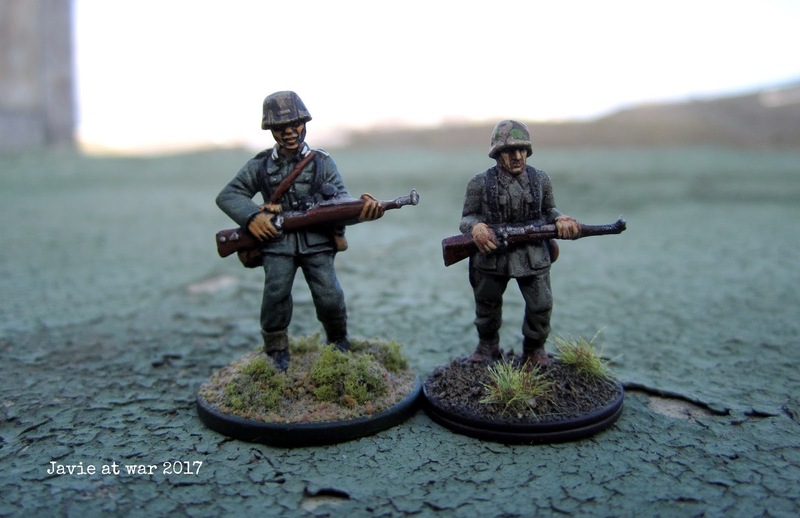 First blood. 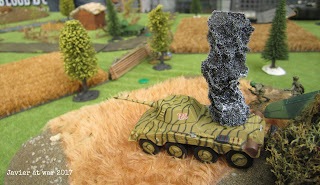 One of my Stug III destroyed in ambush fire one T-34 which was trying to sneak through my left flank. T-34 rushed forward and missed my Pak40, but it did not miss and destroyed one. 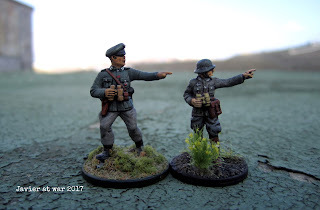 And immediately after them, the German ones. 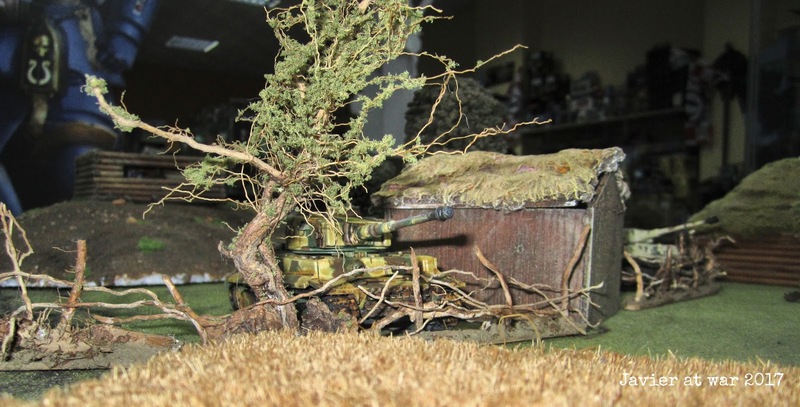 This Stug III tried to outflank the Russian tanks and approximate to the third objective (the house next to the burning T-34) to win the game. 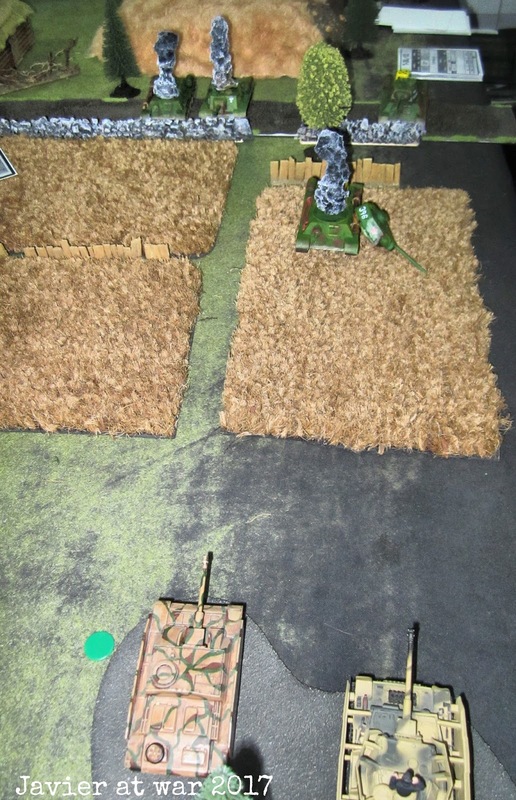 Infantry reinforcements followed the Stug III on the same flank to support him in assaulting the third objective. Although I lost my AT gun due to a tank riders assault, my tanks moved into where it was, and stopped the Russian attack by destroying two more T-34. 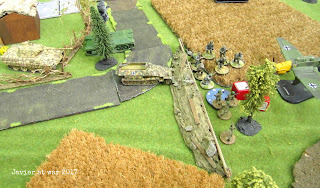 Two Russian squads were closing dangerously to my isolated Stug III but the sniper and one squad were already in position to help it. 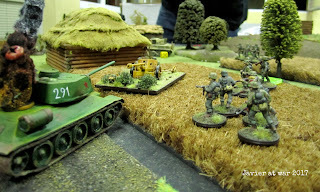 In this moment the Russian broke and the game was over. 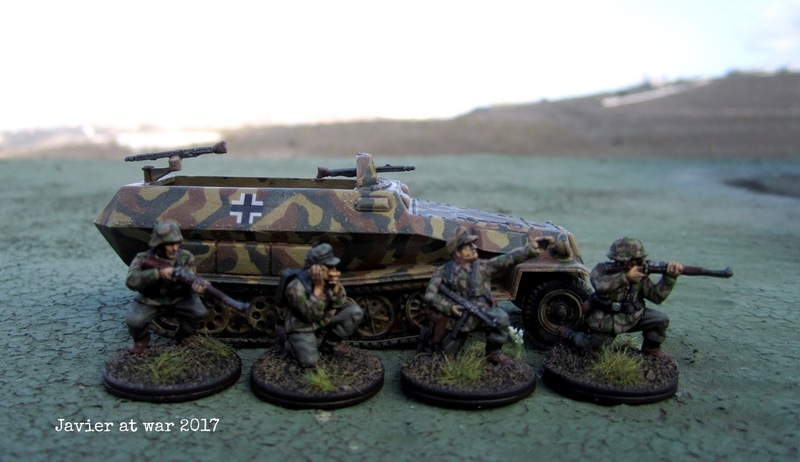 German had only suffered 6 BR points in total. 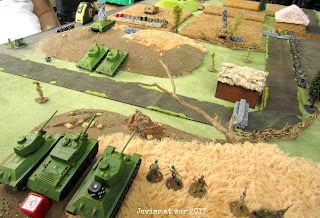 Nice little game. This is our first attack-defence game at 500 points. I'm playing Germans as the attacker. 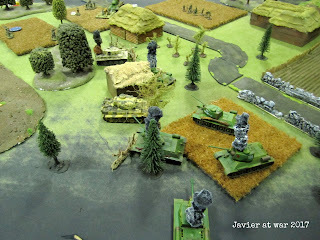 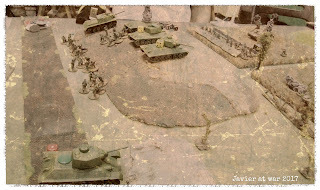 My initial deployment was all my scout units plus up to three units and I picked a panther platoon. 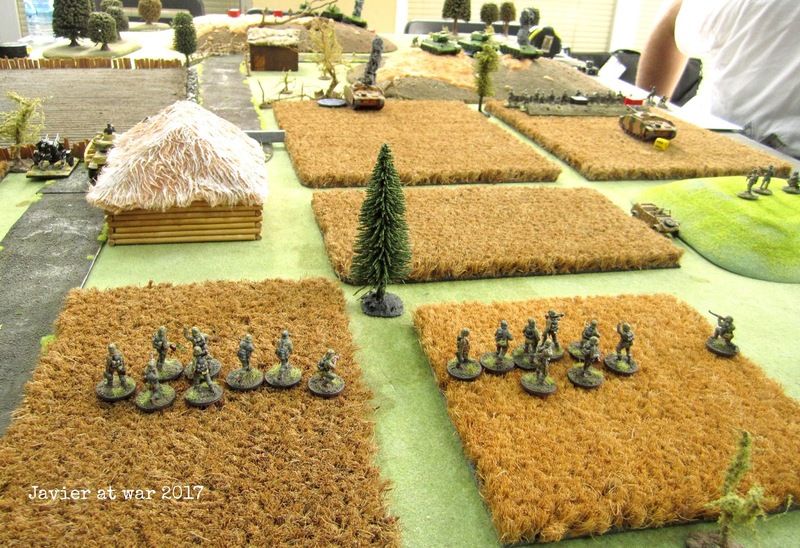 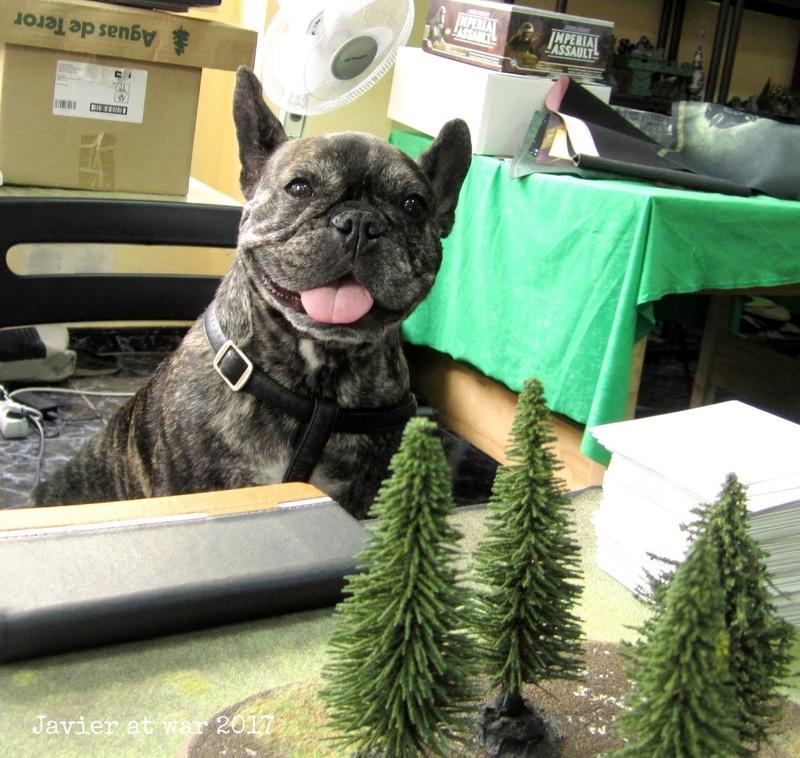 The Russians rolled 2d6 to see how many units he could deploy and scored 7. He deployed two T-34, one Zis, a commissar, an artillery spotter, a senior officer and a comm relay. He thought his 3 of-board 82 mm mortars were more important than deploying some infantry to defend the objectives, and that was a mistake. 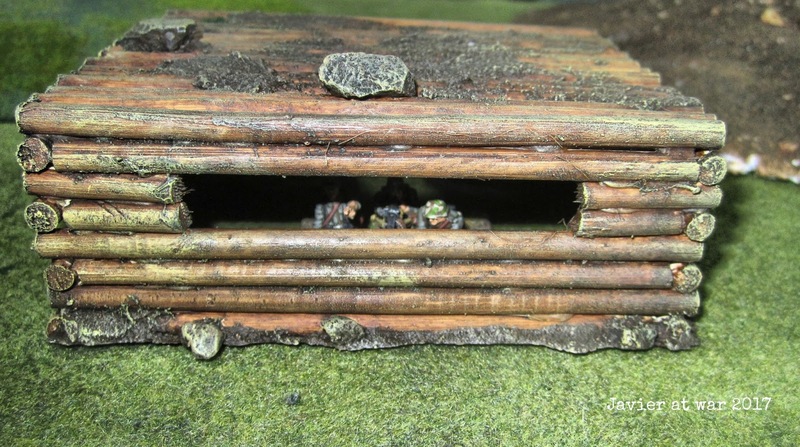 Germans entered on the left. 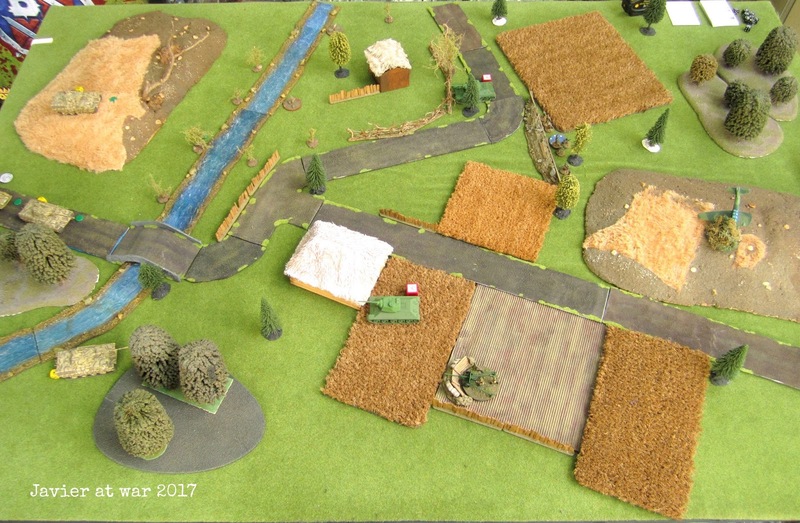 Russians bought some defences and deploy two minefields close to the river, a trench and reinforced cover for the AT gun. 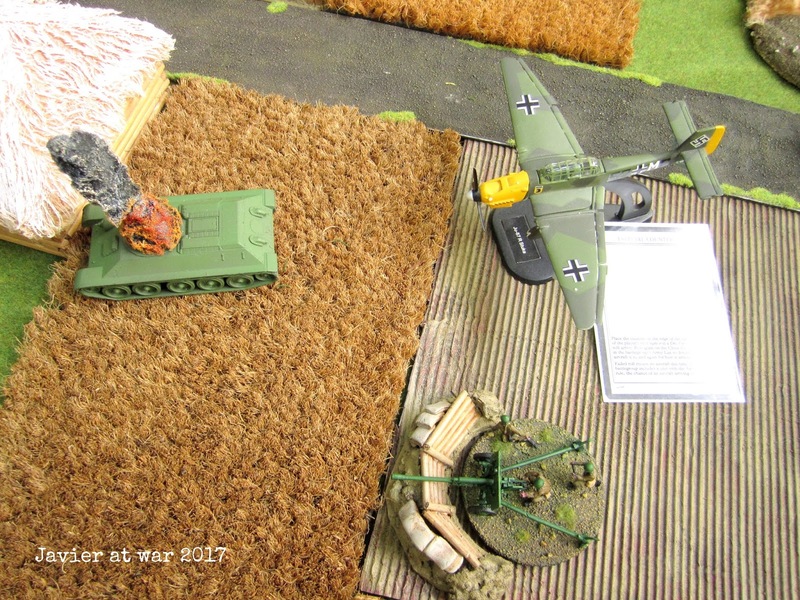 On the first turn I drew up an air attack card and got a Stuka with 37mm cannons. At the beginning of the second turn it dived and destroyed one T-34! 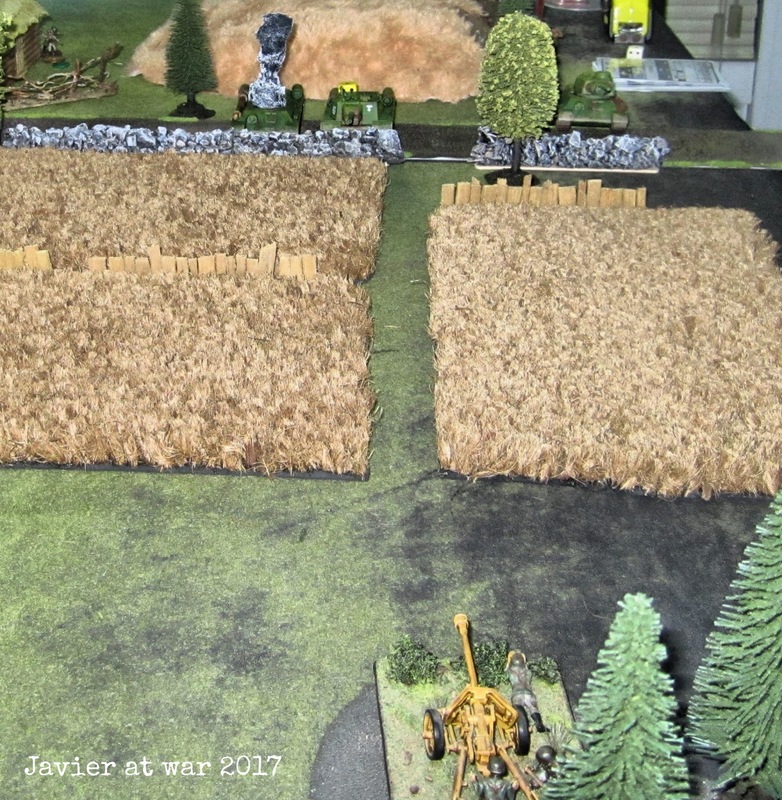 Russians did not puy units on opportunity fire so I raced forwards with my recon, moving 24" twice and seized an unguarded objective. 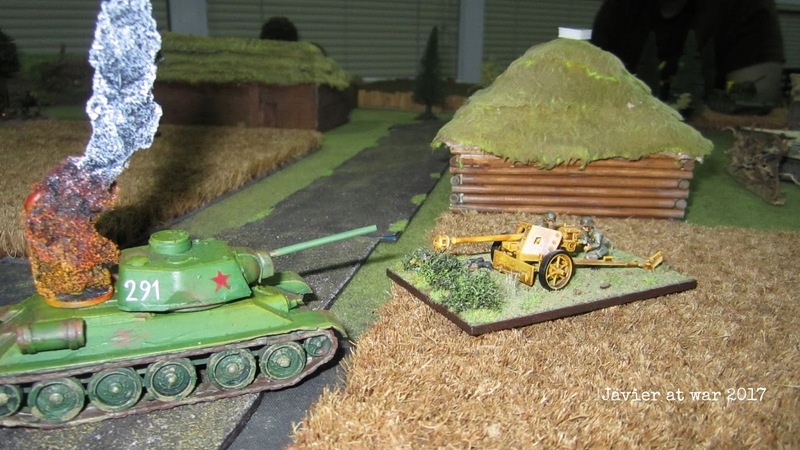 But I did not realise about the other T-34 that could spot me and destroyed my Sdkfz 223. That was the price for the German arrogance. 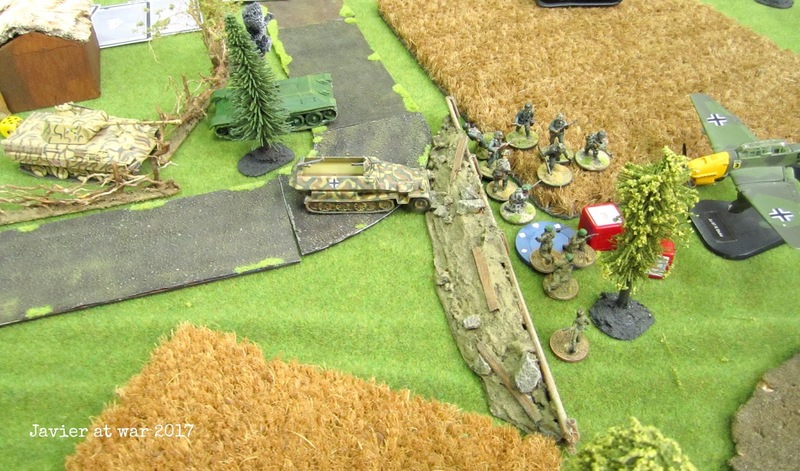 After that, my tanks rolled onwards and crossed the bridge and one Panther destroyed the last T-34. 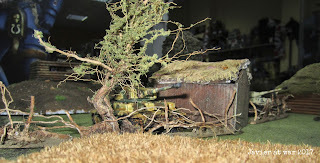 The AT gun was destroyed as well by Tank machine gun fire. 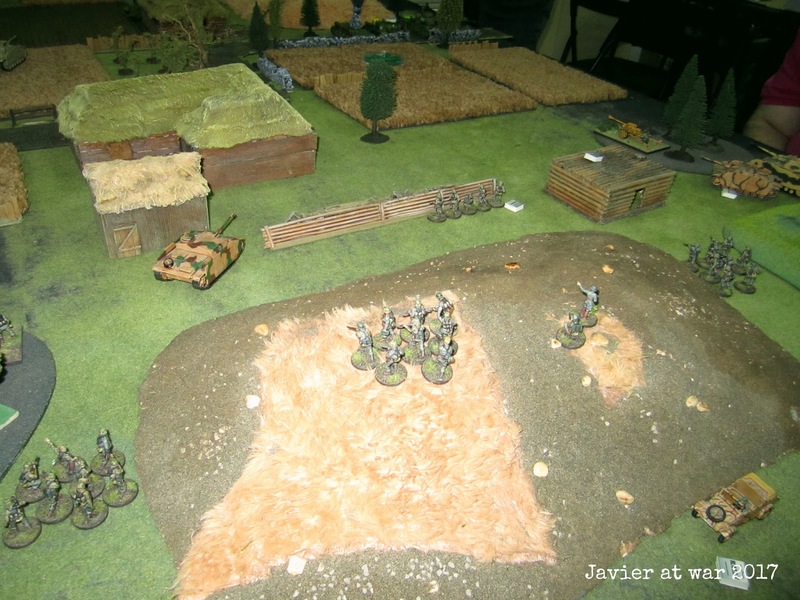 It was the end of my turn 4 and the Russians were going to receive the rest of their army as reinforcements, so I tried to get the third and last objective which was in the trench. My time artillery strike failed miserably by rolling 5 ones with eight dice; then the Stuka failed with its machine guns, and finally I assaulted the trench with one squad of Panzergrenadiers. The machine gun team suppressed the Russian senior squad and the the assaulting infantry team wiped it out, forcing the Russian to take two Battle Rating counters that made him to break and lose the game. 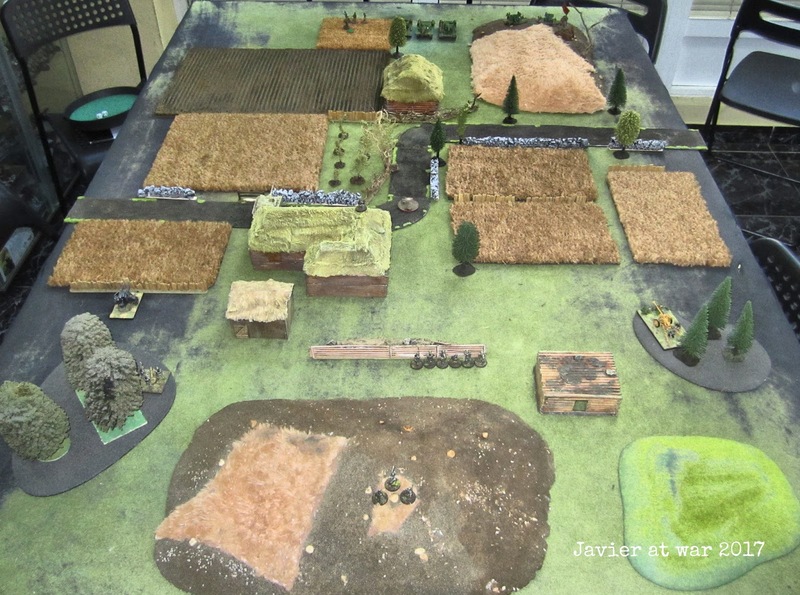 The game was over on turn 4 and before the Russians got their reinforcements, by Germans 15, Russians 32. 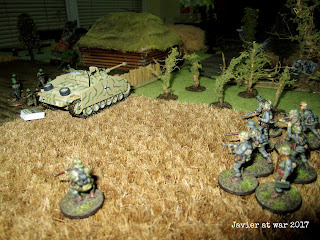 Great game, and fast too.